Naomi Osaka is eyeing off her second straight slam. 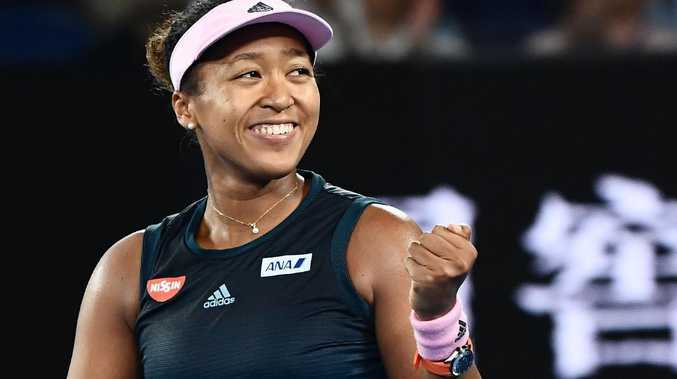 NAOMI Osaka has made it back-to-back grand slam finals after defeating Serena slayer Karolina Pliskova to move into the Australian Open final. Osaka defeated Pliskova 6-2 4-6 6-4 on Thursday, making it 59 straight matches in which she has not lost after winning the opening set. Osaka, the 2018 US Open champion, will face Petra Kvitova on Saturday. The winner will become the new women's world No.1. Kvitova earlier booked her spot in the final by defeating unheralded American Danielle Collins, 7-6(2) 6-0. Kvitova took the opener in a tie-break, after the Rod Laver roof was closed at 4-4 because of extreme heat in Melbourne. The Czech was particularly affected by the heat but under the roof in the second set, Kvitova looked like another player, as the gulf between the two-time grand slam champion and Collins was exposed. Kvitova, a dual Wimbledon winner, is on the comeback trail after she was stabbed by an intruder in her home in late 2016. It will be the first time since 2014 Kvitova has made the final of a major.